And yet I can’t pull myself away. A few weeks ago I began to notice that most of the content I was consuming on the Web – at least, during moments of leisure and/or extreme procrastination – was coming via Facebook or Twitter. A friend or acquaintance would post a link, and I’d follow it. If I liked it, I shared it with others. It didn’t used to be this way. I used to find stuff via Google. Now, not so much. And I’m not alone. Let’s look at some stats. 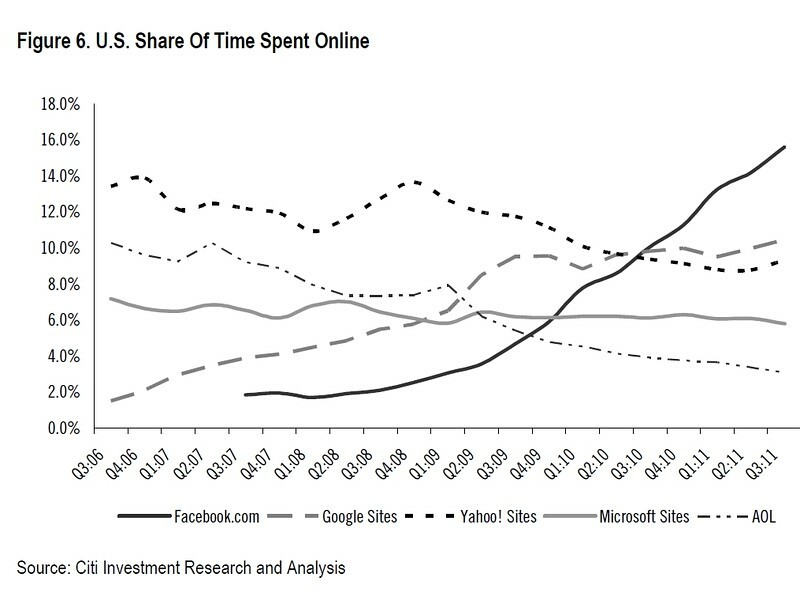 According to the folks at Nielsen, Facebook trails only Google in the number of unique monthly visitors (137 million vs 153 million) but it’s killing Google in time spent on line. People spend about 16 percent of their time online just on Facebook – or more than they do on Yahoo, Google, AOL, and YouTube combined. For the third year in a row “Facebook” was the most searched for term on the Internet, according to Experian Hitwise. And when people look for interesting content, more and more they turn to recommendations from their online buddies. Google recently announced that people share 1 billion items a day on G+ – or about one-fourth the number of items shared on Facebook, a number that’s doubling each year. Google’s once-secure niche as the place people go on the Internet when they don’t where to go on the Internet isn’t so secure any more. Google knows this better than anyone. It’s why they introduced Google+ -- their most most important product since Gmail in 2004. It’s why Larry Page has redirected the company entirely toward social media, in an effort to not fall any further behind Facebook. It seems weird to write about a company like Google -- which so thoroughly dominates search and Web advertising – as “falling behind.” Then again, look at Microsoft. It totally dominates the desktop, but does anybody see it a leader in anything? I think not. I believe people will remember 2011 for many things – the passing of Steve Jobs, the emergence of Amazon as a force to be reckoned with, the use of social media as a vector for social protest. But it really marks the beginning of Facebook’s quest for world dominance. That will only continue in 2012, especially after Facebook’s much-anticipated IPO and the resultant media/hype storm. This is the biggest story of 2011, in my occasionally humble opinion. What do you think? This story, "2011: The Year Facebook Killed Google" was originally published by ITworld.